The World Athletics Championships that ended in Beijing on Aug. 30 could have been called a disaster for the Russian team, if not for the storming victory by Sergei Shubenkov in the 110 m hurdles. But what is the Russian sprinter’s story? 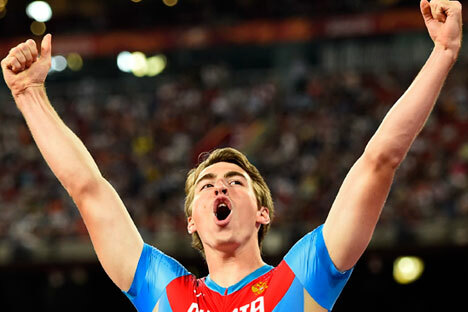 24-year-old Sergei Shubenkov has become a real pioneer for Russia: He has become the first Russian to win gold at the World Athletics Championshipsin hurdling. Russian athletics has never been famous for sprinters: It is the United States and the Caribbean that set the tone. So it is no wonder that Shubenkov, born in the city of Barnaul in Russia’s Altai Territory, was immediately dubbed “the Russian Bolt.” Although the runner considers this outright flattery, he is proud of his capabilities. Despite the fact that Shubenkov's mother Natalya Shubenkova was a 1984 silver medallist in heptathlon, the family is not exactly a classic sports dynasty. “She didn’t try to get me involved in combined events but into athletics as it is. The only thing my mother wanted me to do was to be busy with something. Sports, music school, painting class – anything went, as long as it kept me busy,” Shubenkov told championat.com. Only at 16 did the young man decided to make sport his profession. Intensive training, however, did not impede Shubenkov from learning English and obtaining a degree in law. Shubenkov could have made his name back in the London 2012 Olympics. The athlete arrived in the UK as a rising star and European champion. However, the agitation before such a significant event played havoc with the young athlete’s nerves: Shubenkov did not qualify for the finals. One year later, in Moscow, he took bronze in the world championship, blowing away the judges with his stunning technique. In Beijing, both the then-world champion American David Oliver and his compatriot, Olympic champion and current world record holder Aries Merritt, got taken down by Shubenkov. Shubenkov is completely unlike the old school Russian athletes: terse, withdrawn, spending all their free time in grueling workouts at secluded training bases. He gives interviews, participates in photo shoots for trendy magazines (according to the athlete, the news about his revealing photoshoot for Vogue gathered more internet clicks than the news about his victory at the European Championships), and tweets in English. After the doping scandal when a whole group of Russian athletes were disqualified, all of the country's athletes got under focused attention of doping services. The revelatory films of the German TV channel ARD aggravated an already complicated situation. For instance, Shubenkov's coach Sergei Klevtsov said that one day the doping officers of the Russian Anti-Doping Agency (RUSADA) appeared in training camp so early in the morning that they woke up all the athletes. However, Shubenkov himself believes that clean sport is not so much a team responsibility as individual one. “If the coach offers you the pills, and you accept them and take them — don't go saying later that in Russia there is a whole system working. If the coach tells you, take it or you leave, go and change coach, train independently,” he told the newspaper Sovietsky Sport.